Server security is hugely important. In this edition, we'll cover the initial security precautions you should take. When we first get our hands on a fresh server, some initial security precautions are always warranted, especially if the server is open to a public network. The servers we get on a lot of our popular providers (Digital Ocean, Linode, Rackspace, AWS and so on) are usually open to the public - they are assigned an IP address on their public network upon creation. We'll cover some initial, important security precautions to take. Many hosting/server providers start you off with password-based access to the root user (or occasionally a sudo user who doesn't need a password to run commands as root, similar to Vagrant). The root user can do anything to our system, and so we want to lock down the ability for remote connections to log in as root. So, if we want to remove the ability to remotely access our server as user "root", we need another user to connect with. This user also needs the ability run privileged commands. Allow this user to use "sudo"
That will stop user "root" from remotely logging in and allow our new user to log in. This new user will need a password to run any privileged commands. For the majority of this article, I'm assuming you're logged in as root, and thus don't need to use "sudo" to run the following commands. This will ask you for some information, the most important of which is the password. Take the time to add a somewhat lengthy, secure password. CentOS might require you to run passwd someusername to set a password on the new user. Don't confuse the adduser command with the useradd command. Using adduser takes care of some work that we'd have to do manually otherwise. You can leave the other questions empty or add in their information (full name, room number, and other somewhat useless information). Next, we need to make this new user (someusername) a sudo user. This means allowing the user to use "sudo", to run commands as root. How you do this changes per operating system. On Ubuntu, you can simply add the user to the "sudo" group. (If you need a refresher on what groups are, see the past edition Permissions and User Management). That's it! Now, on non-Ubuntu systems (RedHat, CentOS), you may need to do some extra work to do the same. Now that we have a new, privileged user, we want to stop user "root" from remotely logging in. To do this, we need to edit the /etc/ssh/sshd_config file. Port 1234 # But don't use "1234"
Once you save and edit from the /etc/ssh/sshd_config file, we need to reload the SSH daemon. You should beA prompted for a password - enter the one you created and you should be logged in! Try running some commands as "sudo" to ensure it works. Assuming that's working, we can take this a step further by disallowing users to log in with a password. This means users can only log in with a valid SSH key. This is more secure as it's substantially less likely for a user to get their hands on your SSH private key than it is for them to obtain or guess a password. -t rsa - Create and RSA type key. -b 4096 - Use 4096 bits. 2048 is "usually sufficient", but I go higher. This will ask your for a password. You can either leave this blank (for passwordless access) or enter in a password. I highly suggest using a password - making it so attackers require both your private key AND your SSH password to gain SSH access, in addition to your user's password to run any sudo command on the server! That's three hard things an attacker would need to get in order to do real damage to your server. Note that the SSH password you create is NOT the user password used to run sudo commands on the server. Now we've created a private key file (id_myserveridentity) and a public key file (id_myserveridentity.pub). We need to put the public key on the server, so that the server knows its a key authorized to be used to log in. Copy the contents of the public key file (on Mac: cat ~/.ssh/id_myserveridentity.pub | pbcopy will add it to your clipboard). Once that's copied, you can go into your server as your new user ("someusername" in our example). Note that we'll use "sudo" now, since we're logging in as our new, non-root user. So overall, we're just appending the public key from our local computer to the authorized_keys file of the newly created user on our server. If there's already a key in the authorized_keys file, just add yours on a newline underneath the other. Once the authorized_keys file is saved, you should be able to login using your key. You shouldn't need to do anything more, it should attempt your keys first and, finding one, log in using it. You'll need to enter in your password created while generating your SSH key, if you elected to use a password. Note: You may need to set some permissions of your .ssh directory and authorized_keys file. chmod 700 ~/.ssh && chmod 600 ~/.ssh/authorized_keys. On my Mac, I create a long SSH password and then save the password to my keychain, so I don't have to worry about remembering it. 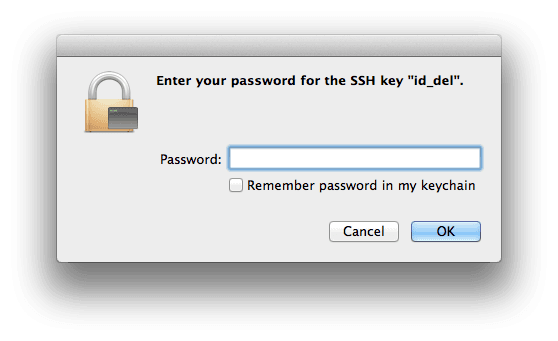 When you log into a server and you have an SSH key setup, your Mac should popup asking for your key's password. You'll have the opportunity to save your password to the Keychain then. The last thing we'll do is to tell our server to only allow remote access via SSH keys (by turning off the ability to log in using a password). You should test that you can still log in after this change before exiting out of the server. And that's it! We've done some basic user security. We've closed off the root user from logging in, create a sudo user, and turned off password authentication. Now in order to log in via SSH, an attacker would need to gain your SSH private key, your SSH password, and then still know your user password to run damaging commands on your server (although there's definitely potential for damage even if an attacker doesn't know the user's password to run sudo commands). If you're a PHP developer, also check out the eBook Building Secure PHP Apps by Ben Edmunds.